XJRunner is the specialised run-time environment for executing pre-compiled XJDeveloper projects. With a range of special features it is particularly aimed at board manufacturers and in-field support. In one package, you have interconnect testing, in-system programming, non-JTAG device testing, serial number handling and configurable log files for your audit trail. It has an easy-to-use GUI, with all the testing capabilities of XJEase. XJRunner tests are loaded from a single encrypted file that contains a compressed version of the XJDeveloper test system created by your design or test engineers. This means that your tests cannot be changed in the production environment. The consistency that this ensures for your testing process can be seen when reviewing the configurable log files that can be produced whenever you test a board. XJRunner has a simple Run/Stop, Pass/Fail interface which makes first pass testing a simple point-and-click operation, ideal for the production line. Configurable run-time messages can tell the tester about any required procedures both before and after testing each board. XJRunner has different levels of users, from Basic users who can simply run a complete set of tests on a board, to Advanced users who can carry out more complex testing and manage projects. Each operator can have a separate login. This allows you to restrict each operator’s access to the XJRunner features they have been trained to use; it can also be used to identify the operator for audit. After a faulty board has been identified on the production line with a default set of Pass/Fail tests, advanced users can then pinpoint faults by running additional tests and debug procedures. They can also choose to run a particular test, or set of tests, a number of times, or even run a test continuously to help diagnose particularly tricky or intermittent problems on a board. All the output from tests is logged. There is a range of logging options, to choose both what is logged (time, date, serial number, user information, etc.) and how the logs should be grouped (e.g. keep all output for the same board in the same file). 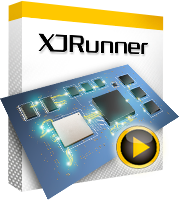 XJRunner can also program and log serial numbers, or other forms of identification such as MAC addresses. These can be generated by XJRunner, taken from the packaged XJDeveloper system, or be input directly (e.g. from a bar code reader). All of the files needed to run tests on a board are packaged together in one XJPack file, making it easy to transfer tests between different computers and sites.